The Western Wall and the Holy Places Rabbi Shmuel Rabinowitz has spoken following the visit to the Kotel by President Trump. 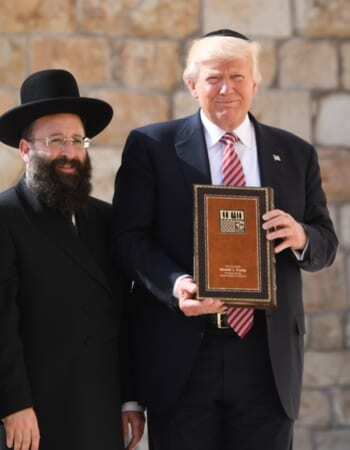 Rabbi Rabinowitz said: “For the very first time in history, the Western Wall Heritage Foundation staff and I have been given the privilege to host the President of the United States, Mr. Donald J. Trump, his wife Melania, his daughter Ivanka, and her husband Jared – here at the Western Wall Plaza. 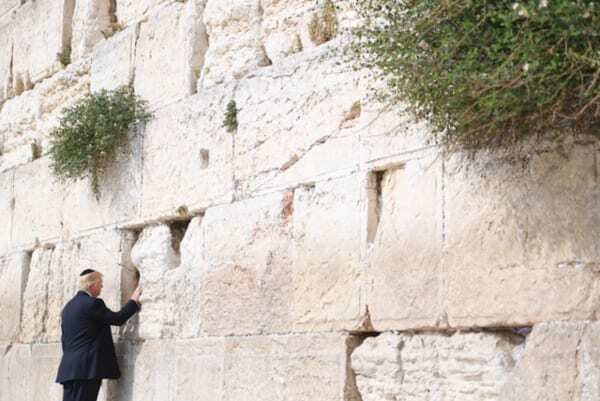 In the name of the entire Jewish people and in the name of all citizens of the State of Israel, I would like to thank the President of the United States and his family for the great honour they have given me and the Jewish nation by visiting this sacred site. The visit of the United States President, Mr. Donald Trump, at the Western Wall, exactly 50 years after it was liberated, is a clear-cut statement on the Western Wall’s historical significance. It is a clear-cut statement on the array of exciting Jewish archaeological remnants that have been found here, at the foot of the Western Wall. These remnants bear witness to the 3,000-year-old connection of the Jewish nation with Jerusalem. It is a clear-cut statement on the spiritual message that emanates from our nation’s capital to the entire world. I believe that leaders of religions around and the world and their emissaries have the power to support an atmosphere of reconciliation, of solidarity, and of peace among all nations. In our area, such an atmosphere is crucially necessary and we maintain it here in Jerusalem every single day. Following this visit, we call on everyone to join forces and work for peace among all nations. We gave the President a souvenir – a special book of Psalms with his name. We prayed together, here at the Western Wall, that this book of Psalms should safeguard him and illuminate his path so that he may safeguard us and the entire world. I wonder what his gift from the pope will be……hopefully not a Crucufix.